In Week 1 we learned about the main food system actors and their primary activities. In this article we take a closer look at some of the major food system actors in Southeast Asia, their roles, and changes resulting from food system modernization in different countries. Food in Southeast Asia has long travelled from farms to city residents along varied and sometimes intricate routes. Production often still starts with small farms – typically family-run – and rural fisherfolk. They sell to rural intermediaries, who sell to wholesale markets that cater to vendors at small urban market stalls. This supply network remains very important, especially to the traditional markets that continue to dominate food systems in much of Southeast Asia. Changing consumer habits are spurring various changes throughout the food systems of Southeast Asia. For one thing, more and more people are buying groceries from a growing number of hypermarkets, supermarkets and convenience stores. This has led to the development of new systems, with food traveling from farms to corporate distribution centres to retail grocery chains. Wholesalers, farmer groups and even individual farmers increasingly work under contracts that specify pricing, delivery details and quality standards. Meanwhile, input suppliers (such as agro-chemical companies), food processors and retailers are providing technical assistance and some credit to an upper band of farmers. Despite these changes, arm’s-length transactions remain a primary form of coordination throughout the food chain. Very few firms operate at more than one level of the rice supply chain, while some integration exists for fresh fruit and vegetables. Vertical integration and coordination may evolve between modern retailers and farmers to reduce risks and minimize uncertainty. New consumer demand in places like Hanoi has also caused farmers to shift cultivation from staples such as rice to higher-value products, such as fruit, vegetables and flowers. At the same time, processed foods are becoming more popular across Southeast Asia. Consumers are interested in convenience, and food companies are shaping tastes and expectations. The packaged food and non-alcoholic beverages market in the five major ASEAN countries reached US$61.6 billion in 2010. This means food travels from farmers to food manufacturers (often through intermediaries and wholesalers). Manufacturers then sell to modern and traditional retailers. The rise of modern grocery stores, with refrigeration, has expanded potential for manufactured products that must be kept cold. Grocery chains are also increasingly offering manufactured foods under their own private-label brand names. The path of imported food products varies by product and country, but generally includes importers, wholesalers and retailers. Some retail chains buy directly from importers or even foreign exporters and wholesalers. As we have heard already this week, governments are also key actors in the food system. 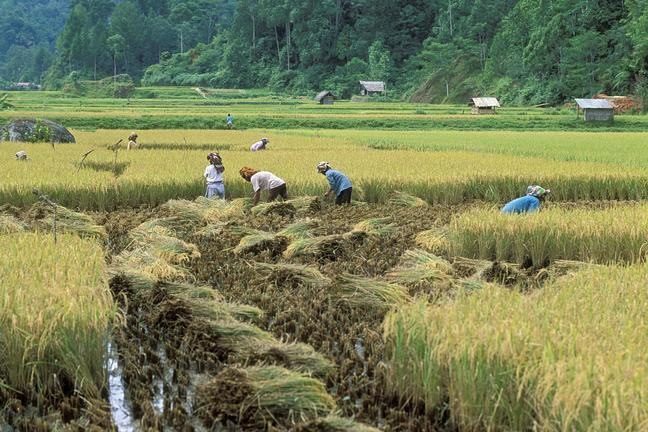 Many Southeast Asian governments – including Thailand, Philippines, Vietnam and Indonesia – highly subsidise rice inputs such as fertilizer and seeds. Thailand and Vietnam are large rice exporters, whereas Indonesia, Philippines and Malaysia are net importers of rice. Indonesia, which also imports such commodities as soybeans, maize, meat, dairy and sugar, is encouraging more domestic production through price supports and trade barriers such as tariffs and import quotas. Vietnam has promoted expansion of supermarkets and is trying to standardize the food supply chain. One example of changes in Southeast Asian food distribution is the vegetable system in Hanoi. There, a system based on a short supply chain and trust relationships is giving way to a longer and regimented supply chain. In 2004, 40% of vegetables eaten in Hanoi were grown in the city, moving from local farmers to collectors to wholesale markets to neighbourhood vendors. In recent years, however, urbanization has moved production further from the city centre, farmers have shifted production from staples to higher-value crops, consumers have demanded more safety assurances in the wake of food poisonings related to pesticide misuse and the government has tried to standardize food distribution. Agriculture and Agri-Food Canada (2012). Modern Grocery Retailing in Major ASEAN Markets. Agriculture and Agri-Food Canada, Ottawa, Canada. Shields, L. (2013). Feeding Hanoi’s urbanisation: What policies to guide the transformation of the urban food system?, Working Paper N°06/13, IDDRI, Paris, France, 14 p.